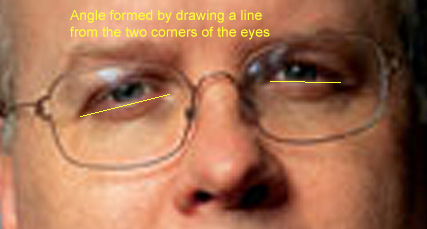 Drawing Eyes: Karl Rove's eyes in particular - reviewing the fundamentals of drawing and using your discoveries as fodder for either exaggeration or realistic portraits. Well, it's kind of hard to do that without also including at least part of the nose, the glasses, the eyebrows, eyelids, etc. And that's just fine because when you draw, recognizing relationships (e.g. how the nose squares up to the eyes, how the size of the iris compares to the nose, etc. ), is a fundamental skill. If you take this much of the face (e.g. like the area around the eyes), and break it down into all it's elements, well we've started a short list, i.e. that list that began with eyes, eyelids, and glasses. To this list let's now add still more specific anatomy like the iris, pupils, upper and lower lids, the palpebral fold, the medial and lateral canthii (that's plural for "canthus", which is Latin for "corner"... i.e. the corners of the eyes), the angle formed by drawing a line from canthus to canthus...etc. All right, you hanging with me? Let's go right through this, I'll point out those things we just talked about about but it's up to you to start integrating it. Remember, everything -- and I mean absolutely everything that's discussed here is discussed in easy-reading, ultra in-depth detail in the YouCanDraw.com book. I'm going to be jumping around, so hang on! If you find yourself asking yourself "what the heck is he talking about now? ", ask yourself which of the fundamental skills of drawing is he talking about - and how does it relate to the anatomy or shape we're discussing? Check out the other eye too -- the one that has no yellow lines pointing to it. Can you make out the pupil? I can't. That's because there's enough of a shadow there that it obscures the dark of the pupil. What does stand out is the highlight. Note too that the highlight doesn't necessarily land right on the pupil (though it often does): it can land on any other part of the eye. I mentioned the highlight on the pupil. Lets keep looking at highlights. 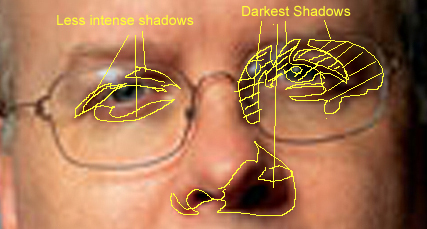 In this next picture I've pointed out or outlined in yellow, areas of highlight or reflected light. Squint your eyes or back away far enough so that you can perceive these bright shapes yourself. If the lines around the highlights seem to obscure their edges, look at the photo above and see if you can't see them as separate shapes. Note in any of these photos (since they're all the same photo :-) both the subtle highlight shapes and the shadows cast by the glasses. If you can see these, you can draw them. Look a little closer here for the the shadow cast by the glasses. They're subtle! And speaking of shadows, I've outlined still more shadow shapes. See, once you stop naming those different parts of anatomy, and you start seeing in terms of lines, edges, shapes, spaces, angles etc. (i.e. in terms of the fundamental elements of drawing) then the leap becomes available. Yes, I know it might sound a little contradictory, i.e. to be naming all these parts and then saying forget about the naming. But that's the main trick in drawing: divorce the words from your senses. Words and naming keep you stuck in the language driven part of the brain, which keeps you blocked from accessing the now-time, shape-proportion-color-line-and-edge deciphering function of the brain. So yes, let's actually get to the picture now. So what's the palpebral fold? It's the skin fold where a large portion of your upper eyelid gets hid, actually gets folded, when you open your eyes. See, I'm building an astute observer out of you even if you didn't want to be one :-). 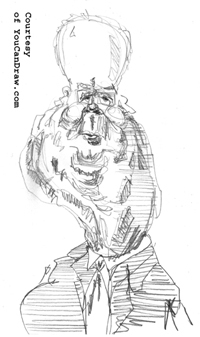 To be the best caricaturist, or the best portrait artist, you must take these seemingly tedious (but I think interesting, even fascinating), observational steps to really get great! means close to the center of the body, lateral means away from it. Like I mentioned a little bit ago, if you can see the edges, shadows and highlights along and around the glasses, ask yourself again the further question "what angle do any lines I see make with horizontal or vertical?" (e.g. what angles do the shadows cast by the frames of the glasses form with vertical and horizontal). And once you observe that, take again this further leap we keep swimming around: ask what angle might a line drawn from the medial canthus to the lateral canthus make? That is, what angle might a line drawn through the canthii make? Perceiving the imaginary line drawn from one corner of the eye to the other: this is a great way to decide how you should draw the eyes - as catlike with upturned corners (which women try to accentuate) or with eyes rotating downward at the outside corners. 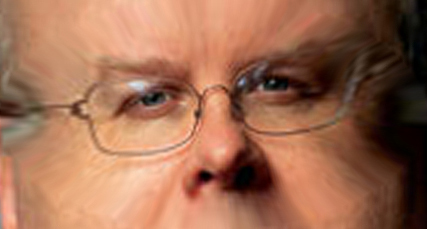 How would you draw Karl? Well the answer's right there in the pudding: downsloping. Now wasn't that easy? So if you scroll back up to the top of the page and review the different spokes of the fundamental drawing skills, can you understand better now how we're applying them to understanding Karl Rove's face? And further, now that you know how to look at Karls face in terms of lines, edges, areas of light, areas of shadow, angles formed between parts -- all those fundamentals, can you imagine how you might exaggerate a caricature? (or draw a realistic portrait?) Cool! I hope that helped a little. Remember, all this is gone through in extreme detail in the Flash Lessons and in the book. Again, the point of this page is two-fold: 1) to do super quick application of the fundamentals of drawing and 2) to look for what's unique about Sir Karl's eyes. If, for instnce you compare them to say, the Dali Lama, you'll instantly see differences. But can you explain in words, in the language of drawing, what makes them different? Apply what's now fresh in your brain to drawing your own version of Karl's eyes, or just use it to study the caricatures below. You could look back at the November Newsletter too. Can you see how the eyes -- and all those other things we discussed above are at work in these pictures? See November's newsletter for bigger pictures. PS -- have a great New Year! 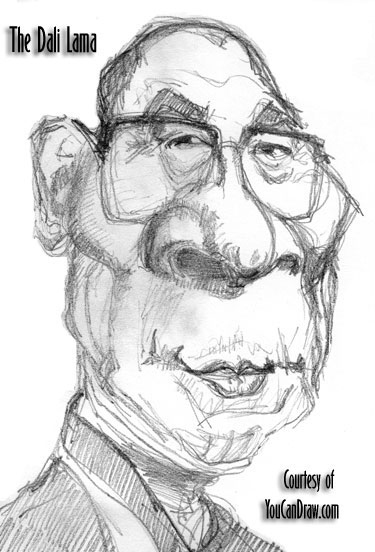 PSS -- As a bonus: Compare Mr. Rove's eyes / lids / eyebrows to this version of the Dali Lama. 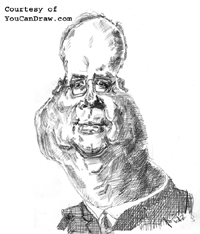 Also note the perspective at work in this "three-quarter" view of Mr. Lama versus the full front on view of Mr. Rove. Try this: Shape of the eyebrows: note the angle they form with the glasses, and note how they drop inside or outside the frames of the glasses.